Can anyone help me with my tomato plants? This first plant has some sort of disease, and i can't figure out what disease and how to cure it. Need an expert to identify the disease and maybe suggest a remedy to cure it? I believe this is the only plant i have with this disease. I'm also getting some rotten tomatoes, what should i do about this? Help! Re: Disease tomatoes, please help. Start a replacement with a cutting from a healthy plant. 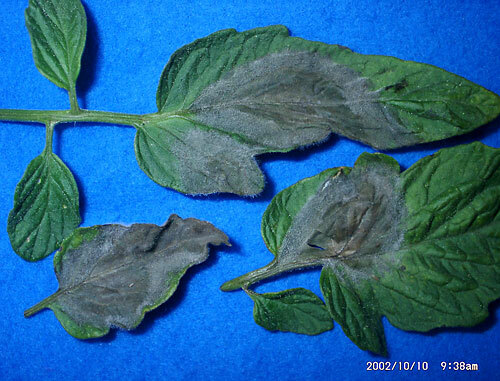 IMO you are not likely to have a badly diseased plant recover to healthy production. A cutting will root in about a week and should be ready for the ground in less than three weeks and should start blooming soon after. I always keep blooming sized replacement plants on hand. Probably will have to use two or three in the next week. It looks pretty severe. It might be better to start over. Remember to bag and trash everything and do not plant the tomato in the same spot. Make sure your tomato is in full sun and has good air circulation. The disease looks fungal. It is common in humid conditions. You may need to be proactive and do preventive fungicides when the weather is humid. Would pruning it down to a single stem help at all? Maybe i could try it and see what happens? also what about the half rotten tomatoes? Just about every plant has them, but only one of the plants is diseased. Should i cut them to prevent bugs? That tomato looks like it has blossom end rot (BER) -- caused by uneven watering inhibiting calcium uptake and delivery to the fruits by the plant. Sometimes seen in first fruits then improves. More often seen in elongated fruits, but beefsteak types can get them, too. I have had good results with neem oil as a preventative against fungal diseases. I spray my plants weekly just before it's too dark to see. It has also helped with squash bugs. Oh! And I'd scratch that one. Pull it, bag it, trash it. 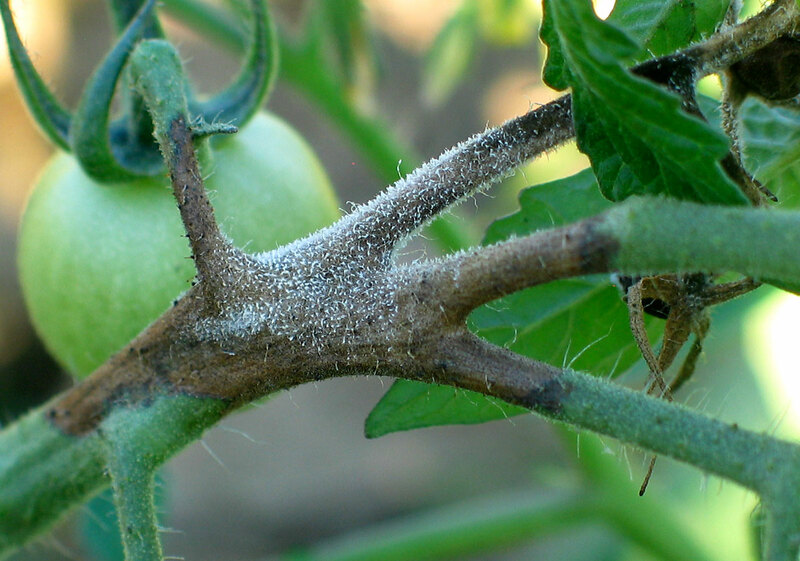 Fungal diseases are hard to treat once they start. It has already advanced to most of your tomatoes so it is also aggressive and late in the game to try to treat it. Cutting it back probably won't help. Lindsaylew82 wrote: Oh! And I'd scratch that one. Pull it, bag it, trash it. So it's not worth the risk? Will it infect other plants? From your post it already has if you have more than one with the disease. Fungal spores are in the air and in the soil so yes they do infect other plants and can live in the soil for years. That last photo is the one that is really worry some. That black streaky look on the stem -- if it's not dirt smear and the black rot goes through the stem -- reminds me of the one year we had late blight here. Where are you located? It would be way too early in the season here for late blight, but my tomato plants are no way as mature as yours. If the black rot runs through the stem -- brown in the cross section of the stem when cut and not all healthy green -- and the infection is in the main trunk or leaf branch low on the plant already, that plant is toast. Bag entire plant and roots, close tight (possibly double bag) and toss. DISINFECT TOOL. It would be a good idea to closely inspect every single plant. Cut off and remove every sign of infection so it will be easier to monitor progression. If rapidly spreading, then drastic action may be necessary to prevent widespread infection. And if you live in a hot summer area that forces a break, then you would proceed with a second planting later for fall-winter growing, you want to preserve the garden from becoming completely contaminated. applestar wrote: That last photo is the one that is really worry some. That black streaky look on the stem -- if it's not dirt smear and the black rot goes through the stem -- reminds me of the one year we had late blight here. Where are you located? It would be way too early in the season here for late blight, but my tomato plants are no way as mature as yours. I live in Mississippi, and tomorrow i will go and pull it out the ground. This is my first time doing a garden which is why I'm trying to find answers online. I'v been EXTREMELY careful around this plant, ever since i noticed black spots i haven't touched it. About two weeks ago it rained for nearly 7 days straight, I'm assuming this is the cause of this disease. I will watch the rest of my plants very closely until i feel safe. overwatering, no aereation, ... prune the lower leaves and stop watering it for sometime, see if the color changes and remove the rotten tomato. Don't give up easily on tomatoes, just stop giving it more love. Also does your soil have good drainage ? before I even got to applestar's post, I was thinking late blight. This picture is when the disease is further advanced and is sporulating, which gives it the fuzzy look. Earlier in the process, it would just be dark. if you think your plant looks like the pictures, I would get rid of it (bag it up and dispose of it) ASAP. Once it starts putting out all those spores, all your plants will be at serious risk, especially in the kind of rainy conditions you describe. The article says: The disease can be very explosive due to the quantity of spores produced and the quick disease cycle under cool, wet conditions. And it is destructive as diseased tissue is killed quickly. Established lesions cannot be controlled, even with the most effective systemic fungicides that can be used by farmers with a pesticide license. very sorry to be the bearer of bad tidings!